The short rains have brought clouds to the Mara, sealing off the wild sky. The ground is damp, the day grey and cool. The scent of wet earth enters the open Land Cruiser as we pass Thomson’s gazelle and herds of wildebeest shuffling across the plain. The radio sounds – a voice fizzes on the other end. I grip the armrests and anchor my legs as our driver accelerates, pulling on the wheel: cheetahs have been sighted nearby. We thunder across the savannah, speeding past desert dates and bushes of orange leaf croton. Soon, other vehicles appear on the surrounding tracks, converging. The air fills with fumes and dust. Four-wheel drives rev and rut, wrestling for position. We surround a single tree. From the roof of another car, people begin to shout, raising their phones. A shape is moving in the direction of the tree, tall yellow grass bending in its wake. More sounds of excitement as engines roar and cars reposition. I can make out multiple shapes now, spread out and torpedoing towards us. Five cheetahs emerge from the grass. Unlike Josephat, our guide and driver, the cats appear unfazed by the laughter, the cars, the clatter of cameras on burst mode. They don’t run or turn to look. We’re just another element in their landscape. They’ve been known to climb on vehicles, jump through open windows. The animals circle the tree, spray it, then they’re on their way. A minibus, out of place and ill-suited to the terrain, squeezes between the four-by-fours, struggling over uneven ground to stop in the cheetahs’ path. It’s illegal to go off road in the reserve but most drivers will do it when the rangers aren’t around. Josephat punches the steering wheel, shouting first in Maasai, then English: ‘They’ve cut them off.’ He reverses and skids away, escaping the frenzy. I grew up here, and I don’t remember this. I’m back in the country after 21 years, for two weeks divided between Nairobi, Maasai Mara and the coast. We used to go on safari often, short trips within Nairobi, and longer excursions to Tsavo, Amboseli, and Maasai Mara. My memories begin in Kenya, my consciousness kickstarted by the radical shift in geography, climate and culture. But on this trip I’ve been encountering things that don’t fit with my recollection. I don’t remember this level of mayhem, just as I don’t remember the elevated concrete railway line cutting through the centre of Nairobi National Park, the piles of plastic on the beaches of Watamu, or the coral in the Marine Park being so beige. These are new experiences to me. The world is different now. We drive in silence for a mile or more until the cars are out of sight, and in an open area Josephat slows to a stop. He kills the engine and collects his thoughts. Silence. A breeze blows through the open roof. Gradually the savannah soothes the smell of grease and metal. A lilac-breasted roller flashes past the windscreen and alights among the thorns. Josephat turns in his seat. He says the cheetahs are famous here. They call them the ‘Fast Five.’ The size of the group is significant – male coalitions usually number just two or three. The largest ever observed in the Mara. More than once, he refers to them as ‘clever’: their hunts are more successful, they are able to take down larger prey. As our wildernesses are shrugged off a shrinking planet, these animals have learned how to thrive. Cheetahs were built for a different world. They’re fine-tuned for a lost environment. Slender and flexible, their bodies were selected for speed – not strength or endurance. They can reach 75 miles an hour, accelerating from zero to 60 in three seconds – when given enough open space. Their spotted coats make them masters of camouflage, hiding cubs from predators, aiding adults on daytime hunts – if they have access to large areas of grassland. Loss of habitat, as well as other issues of climate change and human-wildlife conflict, have so impacted the animals’ abilities that according to the International Union for Conservation of Nature, the number of mature individuals in the wild has fallen to just 6,674 worldwide – down from 100,000 in a little over 100 years. Cheetah cubs in Africa have a 95-percent mortality rate. The critically endangered subspecies, the Asiatic cheetah, once widespread across the continent, is now confined to Iran with fewer than 50 remaining, after centuries of being tamed and used for hunting. 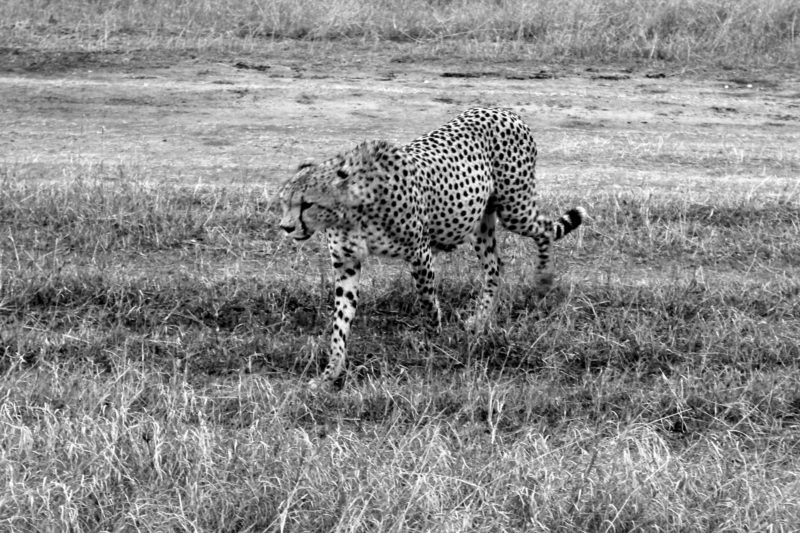 This rapid decline leads to more issues: a diminishing gene pool, combined with historical events that dramatically ‘bottlenecked’ the population, means that cheetahs are so similar to one another they are becoming less fit, less effective at reproducing, and increasingly susceptible to illness. The more identical they become, the less able they are to adapt. Like the trail-blazing designs of the Concorde and the EV1, the cheetah, in a way, is a beautiful failure – a concept so advanced it’s fast becoming obsolete. Josephat is interrupted by the distant splutter of engines. Cars start to appear, bouncing over the horizon. Someone points out of the window, and I realise that we didn’t just stop here to escape the tourists. Five cheetahs are moving towards us through the grass. Josephat knew which direction they were heading and came here to wait. Before the stampede arrives, we have a moment alone. In silence, the Fast Five swagger like a street gang. Cheetahs are quiet creatures, unable to roar, only ‘chirrup’, and purr like cats. Occasionally one stops – cocking his head, considering – and the others halt as well. Two pairs of brothers form part of the group, but it’s impossible to identify them. All five look the same to me: clones. They seem sluggish. Their movements are slow and deliberate; their stomachs are swollen, sagging, distorting their bodies. They’ve killed recently. But even now their speed is obvious, with streamlined frames that could have been carved from balsa wood: long legs and back to maximise stride length; a flattened ribcage and small head to minimise wind resistance; claws that never fully retract, improving grip; a long, curved tail, like a rudder when they run, allowing them to balance and turn mid-sprint. There’s an element of menace, too – mouths hanging open, revealing sharp mandible incisors, distinctive facial marks masking their eyes. We commonly call them tears, but to me it looks more like war paint. The cheetahs in front of me don’t seem sad or subdued. If they have to be anything, they’re embattled. Incensed. I won’t think of them as crying when they’re fighting to exist. Here, the sun always sets at the same time, and I can sense its arrival now. Forms start to fade as a cold wind carries scents of dust and dung. We wait, breathless. The cheetahs reach the road. It’s quiet enough to hear their paws on the ground, padding softly over dirt and quartz: almost weightless. Only a few feet away, now. The one in front meets my eye, one second splintering in infinity, then I’m forgotten as the group steals around us and into the grass. Ahead, fine hairs of dark rain hang over the Serengeti like a lion’s mane. The other cars arrive too late, machine-gun blasts firing from telescopic lenses. Josephat starts the engine. The animals continue towards the Tanzanian border, their silhouettes dwindling. In the distance, one pauses to glance back – a flash of war paint in the racing dusk – then they’re gone. Nicholas Herrmann is a writer and photographer based in Bath, UK. His essays on place, nature and memory have been featured in journals and online, such as Places Journal, Ernest, Elsewhere, The Clearing and The Calvert Journal. His fiction has been shortlisted for the Bath Novel Award and Janklow & Nesbit Prize. He is a graduate of the Creative Writing MA at Bath Spa University.